The 1964 blackface AA1164 Princeton Reverb is an iconic compact amp that can do just about anything. It's a very popular blackface amp kit sold by Mojotone.com and other kit makers but it is an advanced build so I don't recommend it as a first amp build. The preamp is 100% blackface but the phase inverter and power amp are straight out of the 5E3 Deluxe with a cathodyne phase inverter and 2x6V6GT power tubes (fixed bias vs. 5E3 cathode bias). With three fully bypassed preamp gain stages there's lots of overdrive to be had. Every component function is listed. Click on the layout to see the high resolution layout. Download the pdf here and the DIYLC file here. 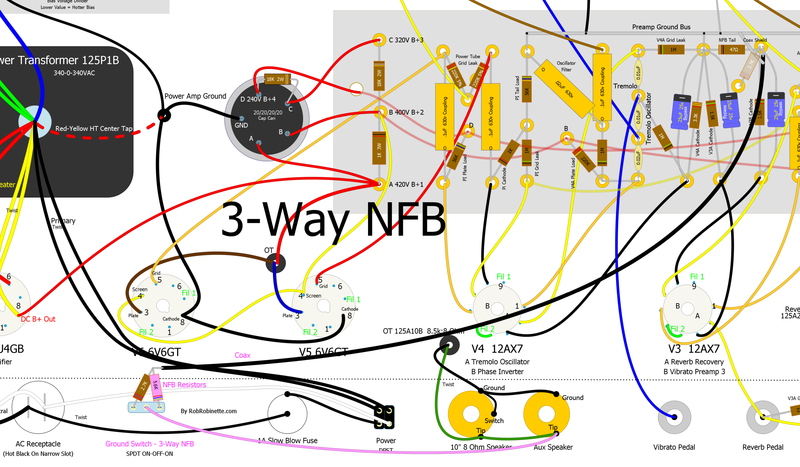 The signal flow colors match between the schematic above and layout below to help you follow the flow. 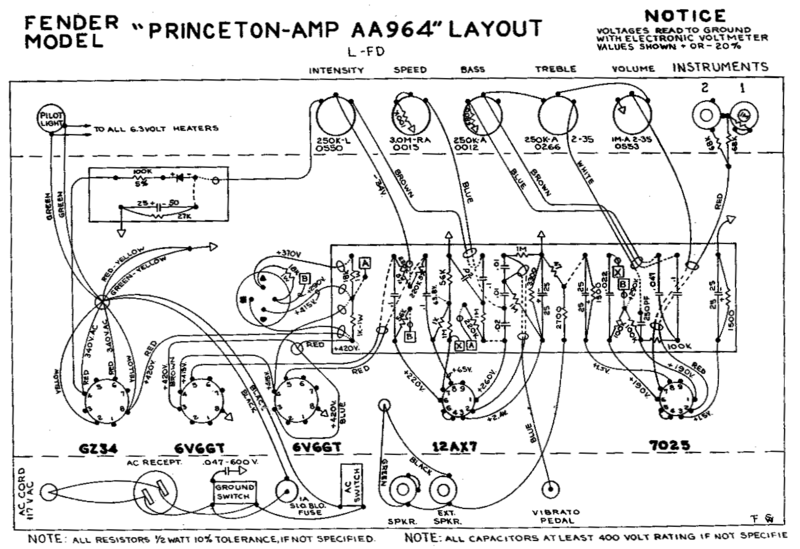 The Princeton Reverb uses a cathodyne phase inverter instead of the AB763's LTP. The cathodyne phase inverter is the primary cause of the tone differences between the Princeton Reverb and other blackface amps. The cathodyne adds no gain whereas the AB763's long tail pair (LTP) adds about 50% of the gain of a typical single triode gain stage. The cathodyne is notorious for funky double frequency blocking distortion when pushed hard into overdrive. Adding a 470k phase inverter grid stop resistor goes a long way toward correcting the overdrive issues and doesn't affect the clean tone at all. I highly recommend this simple mod for all Princeton Reverb models. The Princeton Reverb uses no choke in the power supply so it's a little softer with more power supply sag and compression. 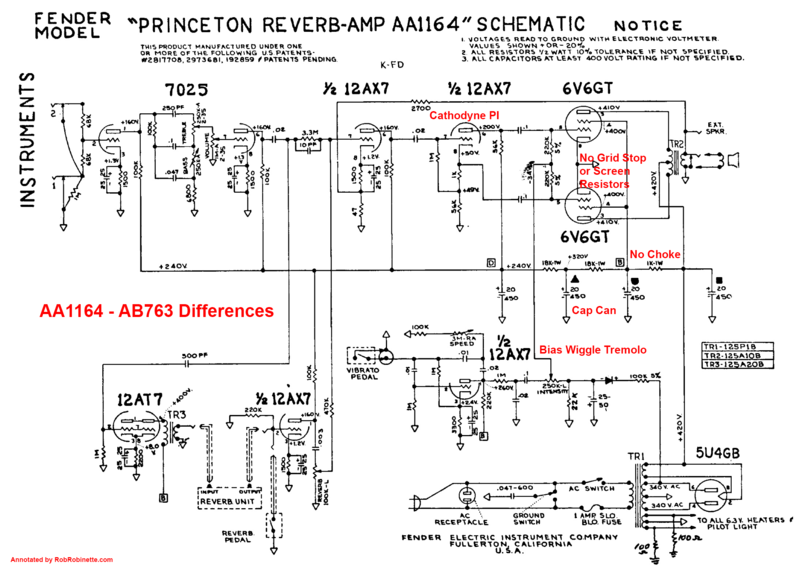 The Princeton Reverb's uses power tube bias wiggle tremolo versus the AB763's preamp signal tremolo. Since bias wiggle tremolo doesn't load down the preamp signal like the AB763's signal tremolo, the guitar signal flowing into the Princeton Reverb's third preamp gain stage is stronger and helps make up for the no-gain phase inverter. 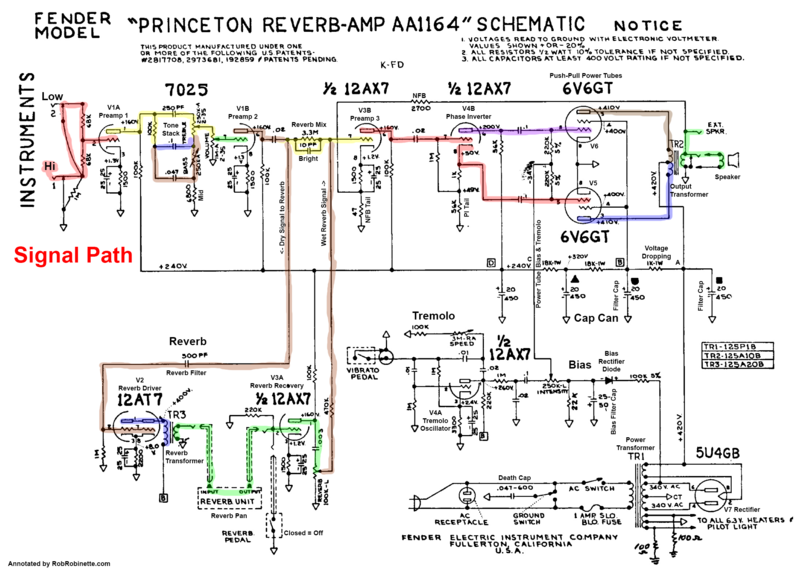 Many people prefer the Princeton Reverb's bias wiggle tremolo but it does have a downside in that if you bias the power tubes too hot you will lose some tremolo intensity. The Princeton Reverb was biased pretty cool from the factory and sounds great so don't fret about this limitation. 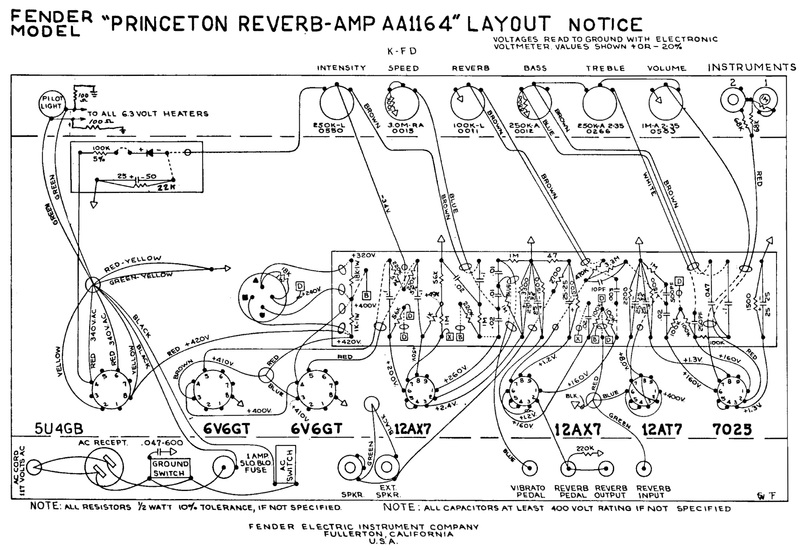 The Princeton Reverb has no power tube grid leak or screen resistors just like the 5E3 Deluxe. Power filtering comes by way of a 20/20/20/20uF cap can. 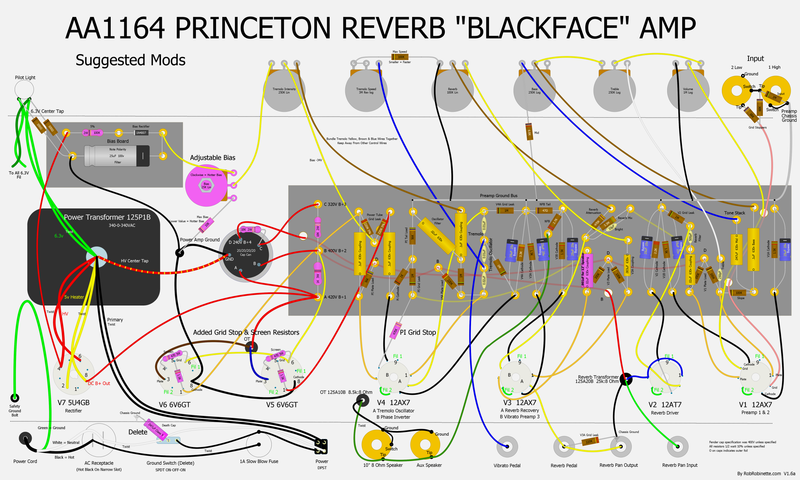 Major differences between the blackface Princeton Reverb and blackface AB763 amps are the cathodyne phase inverter, bias wiggle tremolo, lack of power supply choke, lack of power tube grid stop and screen resistors and the use of a cap can for the power supply filter caps. The cathodyne phase inverter is responsible for most of the tone difference. These are standard Princeton Reverb upgrades (shown in pink) that are universally praised. Adjustable bias is added, bias filter cap is upgraded, phase inverter grid stop resistor added, grid stop and screen resistors are added to the power tubes and the "death cap" is deleted. The bias pot has the authority to bias 6V6 and 6L6 tubes. Be advised though, if you bias too hot you will lose some tremolo intensity. Extra bias filtering can reduce 60Hz hum. The phase inverter grid stop resistor mellows the phase inverter's overdrive behavior by preventing nasty sounding double frequency blocking distortion--I highly recommend this mod for all Princeton Reverbs. The grid stop and screen resistors help the power tube circuit deal with heavy overdrive and sweeten the overdrive tone. This mod is a must if you want to run 6L6 or 5881 power tubes. I also recommend upgrading the four voltage dropping resistors' watt rating (two at far left of circuit board, one on the cap can and one on the bias board) to the values shown in the layout above. Upgrading all of the plate load resistors to 2 watt resistors will reduce amp hiss and increase longevity. The "death cap" should be deleted but if you insist on keeping it then replace the cap with a $1 Kemet 900 Series .01uF 400VDC 250VAC Class Y safety capacitor. If you need more clean headroom I recommend an upgrade to an efficient 12" speaker. Most 12" speakers will fit into the Princeton Reverb cab. This amp was built from a HoffmanAmps.com Princeton Reverb kit. Lead dress in amps with reverb and tremolo is very important to prevent hums, oscillation and instability. This amp is a solid build and very quiet. Pay close attention to routing the tremolo's control and tube socket leads. They carry a powerful signal that can interact with nearby leads and components. Click the image to see the high resolution version. 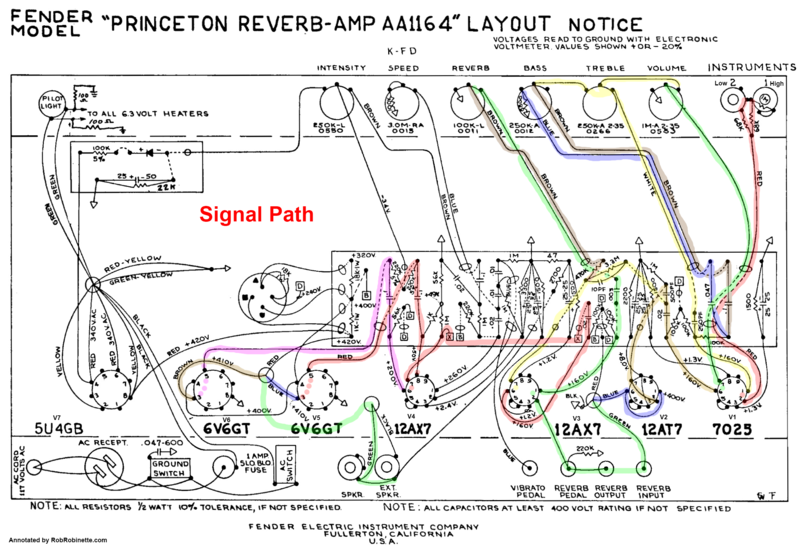 Hoffman-circuit Princeton Reverb. Build and photo by Dave Hill. You can leave the original 2.7k NFB resistor in place and wire the Ground Switch as shown in the layout below. Run the NFB wire from the Aux Speaker jack to the Ground Switch center terminal. Keep this wire down close against the chassis corner to reduce noise pickup. Then connect a 2.7k and 5.6k resistor as shown and solder to the Ground Switch's two outside terminals. Feel free to try your own NFB resistor values. If you want to try heavy NFB use a 1.5k NFB resistor. Use coax to run the connection from the two NFB resistors back to the original NFB resistor's upper eyelet as shown below. Ground only one end of the coax to prevent a ground loop. The Ground Switch is a SPDT ON-OFF-ON switch. 3-Way NFB Switch installed in place of the Ground Switch. The switch center position is no NFB, the 2.7k resistor will give you normal NFB and the 5.6k resistor will give you half of normal NFB. Some people find "No NFB" too loose and hairy to be of use to them. If you don't like the "No NFB" position you can use this arrangement of resistors to give you "Normal", "Light" and "Heavy" NFB options. The center position uses only the 5.6k resistor for "Light" NFB (half of normal NFB). 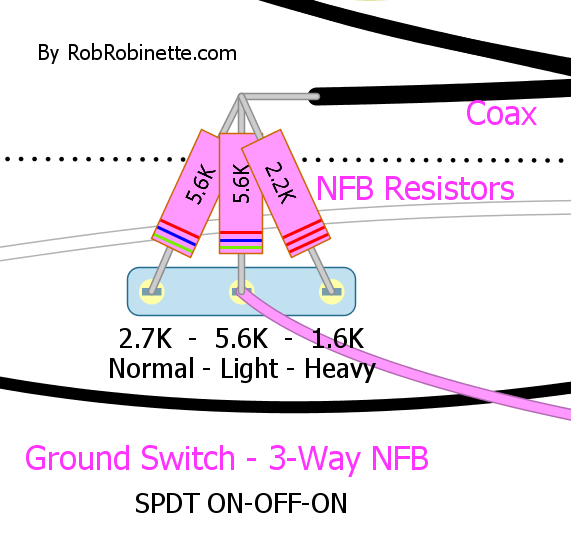 The left position parallels the two 5.6k resistors for factory or "Normal" 2.7k of NFB resistance. The right position parallels the 5.6k and 2.2k resistors for 1.6k of "Heavy" NFB resistance (twice normal NFB). If you need more clean headroom and volume than what an efficient speaker can do then the "Stokes Mod" is an easy way to get it. The phase inverter is powered by the "D" power node with only 240 volts on tap. The Stokes Mod changes the phase inverter's power source to the unused "C" power node located at the extreme upper left of the circuit board. The C power node has 320 volts to give the phase inverter a larger signal swing before distortion begins for added headroom. The two pink wires are the Stokes Mod: One connects the C power node (top left circuit board) to the top of the 56k phase inverter plate load resistor and the other runs from the cap can D power node to the V3 plate load resistors. 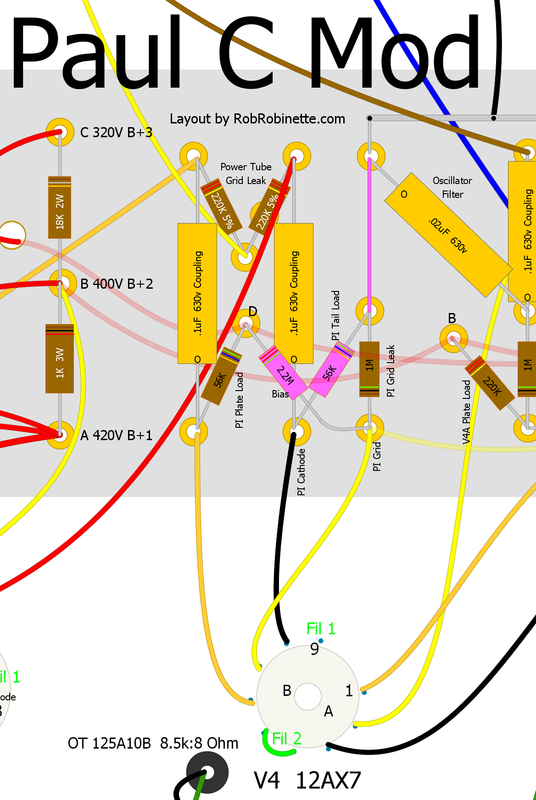 Compare this wiring to the factory wiring in the layout at the top of this page. The Paul C mod changes the cathodyne phase inverter from cathode bias to fixed bias to offer more clean headroom and give a more balanced output. Factory phase inverter first, then the Paul C Mod. The 1k cathode resistor is replaced with a jumper. A 2.2M bias resistor is added and connects to the "D" power node at the top of the 56k PI plate load resistor. 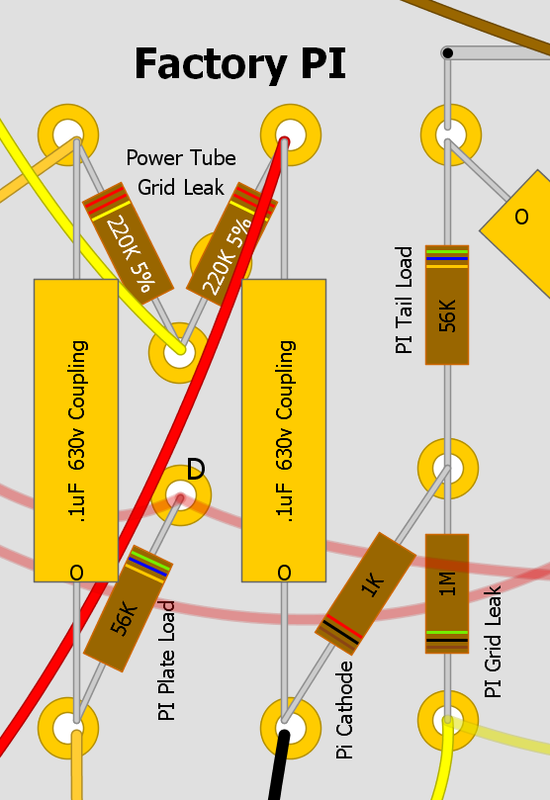 The 1M grid leak resistor is connected directly to ground. The 2.2M resistor can alternately be connected to the "C" 320V power node at the upper left corner of the circuit board for even more clean headroom. A GZ34 rectifier tube will raise amp voltages, stiffen the power supply for less sag & compression, tighten up the bottom end and add a little clean headroom. Upgrading the first filter cap section to 40uF will help tighten up the amp's bottom end and reduce "fartiness". You can simply add a 20uF cap from the cap can's A terminal to the "Power Amp Ground" to parallel the existing 20uF cap can A filter. 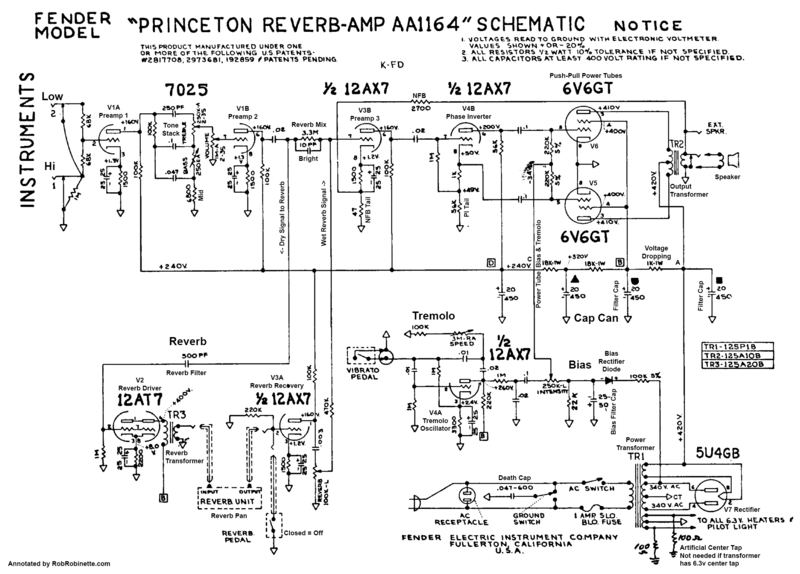 The Princeton Reverb can run 6L6 power tubes but it puts a strain on the underrated power and output transformers. You'll also get much less power tube overdrive because 6L6s can take a much larger signal on their grid before distortion begins. If you must run big bottle tubes I recommend 5881s and the use of a GZ34 rectifier, or even better, a solid state rectifier plug-in like the Weber Copper Cap to help meet the heavy power demand of the big tubes. Upgrading the first filter cap section as mentioned in the previous paragraph will also help. The AllenAmps.com TO26 is a drop-in upgrade output transformer that is designed for 6V6, 6L6 and EL34 power tubes. The AllenAmps.com TP25 power transformer is also a drop-in upgrade that is designed to power 6V6, 6L6 and EL34 power tubes. 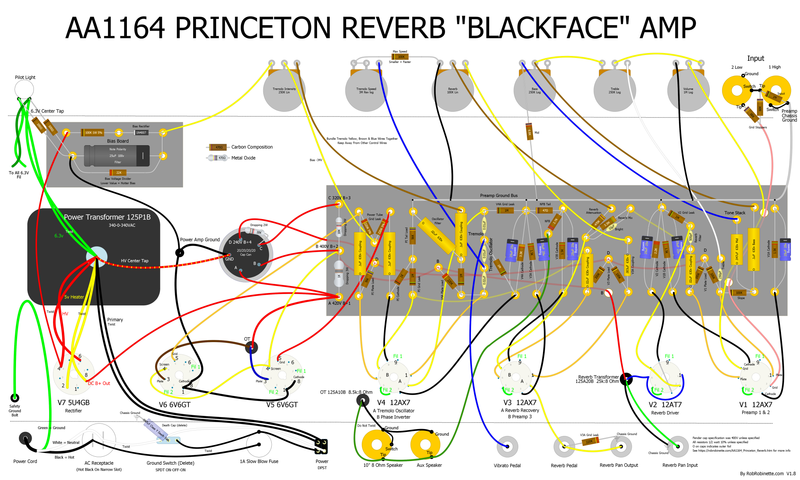 If you really want to run 6L6 tubes in your Princeton Reverb this is the way to go. The Deluxe Reverb output transformer is also a drop-in replacement that will reduce compression, add some low end and add output power. It really helps with 6L6 tubes too. There are upgraded power transformers available that will liven up the amp and really help run 6L6 tubes up to their full potential.